Due to the Away meeting being held in Tamworth from 1-3 April, there will not be a Friday Showcase in April. Join us at the next Friday Showcase on 6 May to see Judy Day's stunning quilts. The next Sewing in the Office event for Community Quilts is on Monday 28 March 10.30am-2pm. Bring along your sewing kit and join in the fun. For further information contact Maree Gebhardt. Our guest speaker was Lynn Hewitt who is a past President & long time member of the Quilters' Guild of NSW Inc. Lynn has been visiting Japan since 2002, when she and Jane Gibson were invited by the city of Nagoya to represent Sydney and the Quilters' Guild of NSW Inc at the International Quilt Fair. Since that first visit Lynn has been back 5 times, including twice as the tour leader for quilting tours. Apart from her own visits, Lynn's original interest began through her daughter, who learned Japanese and went there on a school exchange - thus beginning a series of return visits firstly by school children and then followed later by adults, a number of whom have become good friends with Lynn and her husband Ted. Lynn began her talk with a PowerPoint presentation showing a map of Japan to highlight the various areas where textiles are produced. As she progressed through the talk, Lynn described the different textile types and their production. She also explained the origin of the Kamon crest which we are so used to seeing in quilts today and how Sashiko was used to patch and mend garments. (A fireman’s outfit was made of many layers stitched together and when needed was doused with water to protect him from the fires). After her very informative talk Lynn showed many examples of the textiles she had described earlier. She then went on to show some of the quilts she has made using her Japanese fabric. Some of it was most unusual, one piece purported to be woven banana leaf, but she couldn’t actually confirm this as her Japanese didn't stretch that far. But it was an interesting piece to see! Following Lynn’s talk and her showcase there was a great ‘Show and Tell’ from the audience ranging from amazing fabrics picked up in the backstreets, kimono and yukata garments, and of course lovely quilts made from Japanese fabrics. The Jacaranda City Quilters of Grafton invite entries for their Exhibition Challenge, with the theme of A Song Title. Each entry may be quilting category Q (quilted by the owner) or P (professionally quilted). Entries may also be made to Section E - these quilts are for exhibit only and do not have to be related to a song title. Entry forms are available from Marian Brown, phone 02 6644 9434 or Anne Carter, phone 02 6643 1353 or email Jacs9@mail.com Entries close May 1. The exhibition will be at the Grafton Community Centre, 59 Duke Street, Grafton on June 17 and 18 (10am-5pm) and 19 (10am-4pm). Admission is $5 for adults, no charge for children under 16. 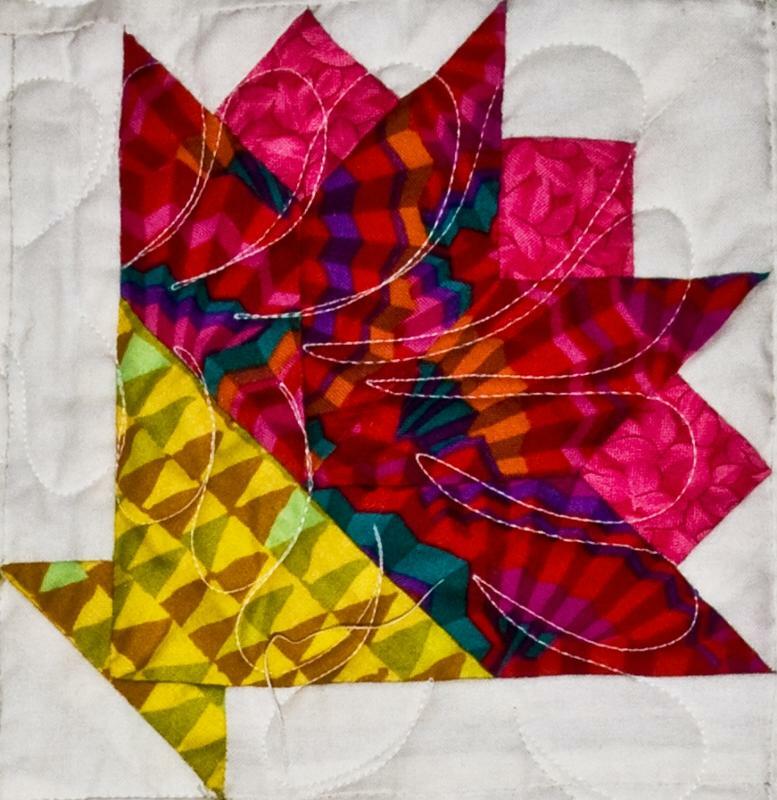 “Quilt Show at the Cathedral” at St Saviours Cathedral Hall – Burke St, Goulburn on Saturday and Sunday, 12 and 13 March from 10am-4pm in conjunction with Goulburn ’s “Rose Festival”. The Casterton Kelpie Association Quilting Challenge in 2011 is to make a quilt no bigger than one metre square on the theme 'A little bit country'. Entries based on traditional or art/textile styles are welcome. The closing date for entries is 20 May 2011. For further details, contact Anne James.